Gary Pinkerton kicks off this 10th show with a look back at his speech from Meet the Masters. In it, Gary talked about how he’s redefined his life to focus on sharing his unique genius with the world. He believes that some of the work Dan Millman, Jason’s guest for the day, has done can help you achieve your unique genius. 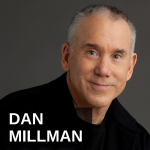 Then, Jason Hartman talks with Dan Millman. He is the author of, “Way of the Peaceful Warrior: A Book That Changes Lives” and “The Creative Compass: Writing Your Way from Inspiration to Publication.” He’s also the former director of gymnastics at Stanford University and a former world champion athlete, martial arts instructor, and college professor.